Baltimore's Cloth Diaper Service - Why Cloth? Using cloth diapers has never been easier. The cotton diaper is put on your baby and covered with a waterproof cover. You can choose to use a Snappi® to keep the cotton diaper closed snugly, but the diaper cover will also keep the diaper securely on your baby. Before your baby starts solid foods, just toss all diapers into the diaper pail. 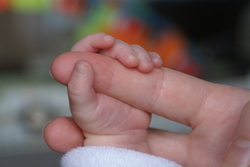 After your baby is eating solid food the poops are generally solid. We ask that you put these solid poops into the toilet to reduce staining and odor. If it's not solid, you don't have to worry about it. Because children in cloth diapers often potty train up to a year earlier, you can plan to save almost $1,000 by using a diaper service (and avoid changing thousands of diapers!). You are choosing to put only 100% cotton next to your baby’s precious skin and you are not exposing your baby to the chemicals present in disposable diapers. Cotton is a naturally soft and absorbent way to keep your baby clean and comfortable. Which would you choose for yourself? Cotton or a combination of plastic, paper, and chemicals? Children in cloth diapers often potty train earlier than those in disposables. You will never have to run to the store to pick up diapers. Green Spring Diapers is a family-owned business located right here in Maryland. Choosing to use a local company provides local jobs and supports Maryland’s economy. Using disposable diapers funnels money out of our local economy. Green Spring Diapers supports other local business whenever possible. Using cloth diapers for two years will prevent an estimated 4,700 disposable diapers from ending up in landfills where they will sit for hundreds of years. Using cloth diapers shows that treating the earth gently is important to you. According to the Real Diaper Association, disposable diapers are the third largest single consumer item in landfills, and represent about 4% of solid waste. 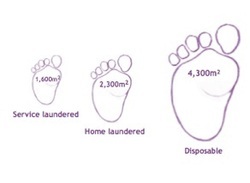 This image shows the relative energy use of service-laundered, home-laundered, and disposable diapers. Children who wear cloth generally potty train earlier, therefore reducing the energy use even further. Cloth diapers help children learn to potty train earlier because they feel when their diapers get wet.